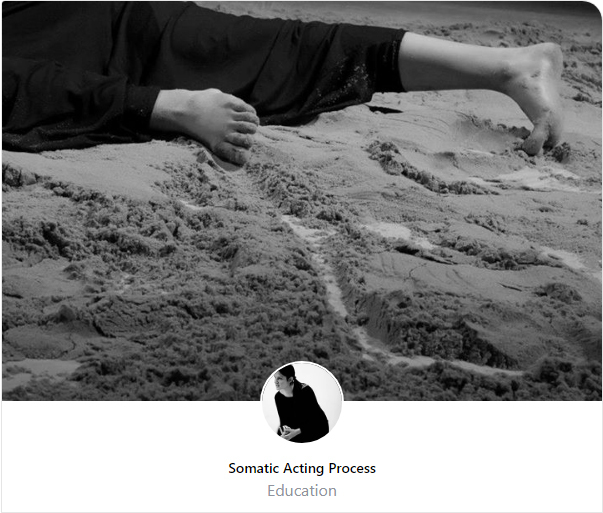 I am a London-based actress, somatic acting-movement educator/director and researcher with an ongoing experience in acting since 2005. I am a Greek National Theatre Drama School (Diploma-Distinction)-East 15 Acting School (MA-Distinction) alumni, and an ISMETA Registered Somatic Movement Educator (RSME, Cert IBMT/BMC®) based on principles of Body-Mind Centering®, Authentic Movement and Somatic Psychology. I also have a background in classical singing (Advanced Certificate-Distinction), music theatre (LCM Grade 5-Distinction), classical piano, dance and literature (BA Hons). Since 2010 I moved to London from Greece for my postgraduate studies in acting, I started focusing upon my journey of becoming an actor-trainer through an actress' awareness. I formally shaped and critically interrogated this process of becoming within a practice-as-research doctoral thesis on the development of a somatic acting process. I was formally awarded my PhD by Royal Central School of Speech and Drama (RCSSD) in June 2016, under the supervision of Dr Stephe Harrop and Dr Konstantinos Thomaidis. Through my PhD I managed to find the embodied and critical awareness of the trainer-witness I wish to be. I started teaching actors and artists in London-based institutions (including East 15, RCSSD, Mountview, Rose Bruford) and independent contexts. I also shaped the ground of my original Somatic Acting Process® practice. Since April 2018 I am a full-time Lecturer in Theatre and Movement at East 15 Acting School. As an early-career researcher I share my praxis in international conferences and publications. I am a member of TaPRA Performer Training and IFTR Performance-as-Research Working Groups. For my development as an artist and researcher I have been awarded a full-time scholarship in Theatre Studies by the Greek State Scholarships Foundation (IKY) and Elsie Fogerty Research studentship by RCSSD. My latest performing experience focuses on research and socially-inspired projects. I currently explore a form of experiential intersubjective performance in-between actor-witnesses and active spectator-witnesses which I identify as Somatic Theatre.